A movie's usually the safest bet for that crucial first date. You can make it an intimate, luxurious experience at the best new cinema in Manila! Picture this: you're on your very first date with that cute guy you've been crushing on for ages. You're at the movies, watching the latest rom-com. The lights are low, it gets quiet, and then he reaches for your hand. Except the kilig factor is completely ruined when the person sitting on your other side accidentally elbows you while trying to dig into his tub of popcorn. Bummer, right? Good thing it's not something you have to deal with anymore! The Newport Ultra Cinema at Newport City, Resorts World is the perfect place for those movie dates that aren't just about the movies. The 80 seats in the Ultra Cinema are split into pairs by barriers, making sure that you and your hot date get some privacy. The seats themselves are a slice of heaven straight from Italy—super comfy Lazy Boy-style recliners that you can sink into, making your night out extra intimate. The seats recline almost all the way back, and there's a leg extension so you can prop up your feet, or even curl up like you're in bed at home. The theater is arranged at an incline, so you never have to worry about someone's head blocking your view of the screen. The screen itself is huge, so you'll never feel like you could have made do with the widescreen at home. Even better, the Ultra Cinema has a little buzzer next to each seat so that you can call a personal butler to bring you more popcorn or soda—yes, they're bottomless, and you don't have to get up to get more! Admittedly, the Ultra Cinema might be a bit awkward for a barkada night out because of the paired seating, especially if you're in an odd-numbered group. Luckily, the Newport Cinema also comes equipped with two regular cinemas that are perfect for those everyday moviegoing occasions, and a Digital 3D Cinema for that ultimate visual experience. Catching a flick at the Ultra Cinema will set you back P450 per person, but it's well worth it for those special occasions! Every seat is the best seat in the house and it'll be the most luxurious movie experience you'll ever have. 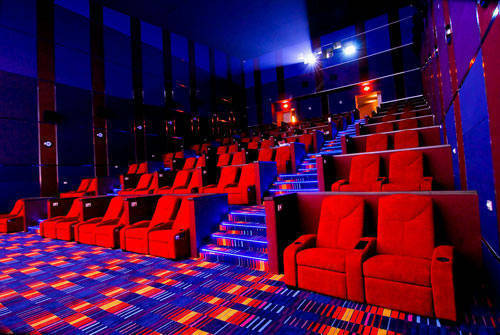 Check out the Newport Cinema at the top floor of Newport City in Resorts World, Pasay City. Ultra Cinema tickets are P450 per person, Digital 3D Cinema tickets are P300 per person, and the regular cinemas cost P180 per person.